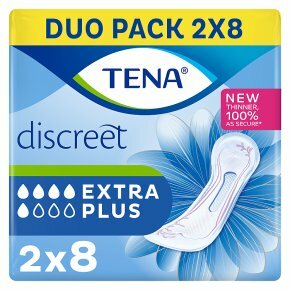 TENA Lady Extra Plus with TRIPLE PROTECTION is specially designed for ultimate protection. These silky soft pads are super secure with InstaDRYTM Zone and a close body fit. The unique InstaDRY technology draws liquid instantly away form the skin deep into the pad, gives a comfortable feeling and keeps women dry. With Fresh Odour Control and up to 100% leakage security, they are a perfect choice for moderate incontinence.